Marilyn SanClemente March 25, 2014 March 25, 2014 Sale-a-bration, Specials, Spring, Stampin' Up! My card for today is for this week’s Mojo Monday challenge. This week is the last week for Sale-a-bration. So this card showcases the Banner blast stamp set with coordinating punch that are part of this year’s Sale-a-bration sale! Next Mon. the 31st is the last day to order and receive the FREE items for Sale-a-bration. So the details of this card: The card base is smokey slate card stock with a layer of the This and That Epic Day design paper – which by the way is on the sale rack this week as part of the weekly specials!! And I didn’t even plan that! 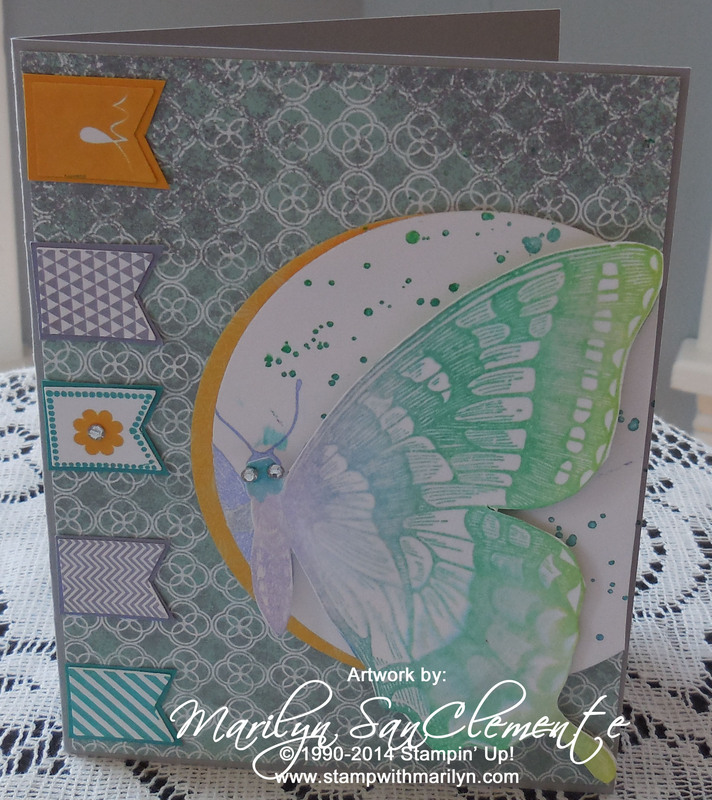 The butterfly stamp is the Swallowtail Butterfly that is in the Ideas Book and Catalog. 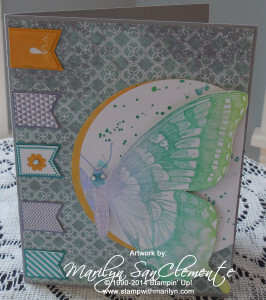 I used the Gorgeous Grunge stamp set to add a little dimension to the background. The butterfly and coordinating Crushed Curry layer are cut out with the Circles Framelits. 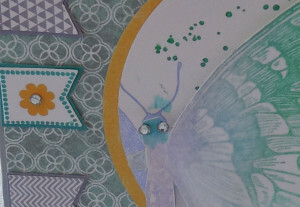 The Swallowtail is stamped with one of the old Kaliedascope pads inked up with a brayer to achieve the rainbow effect. 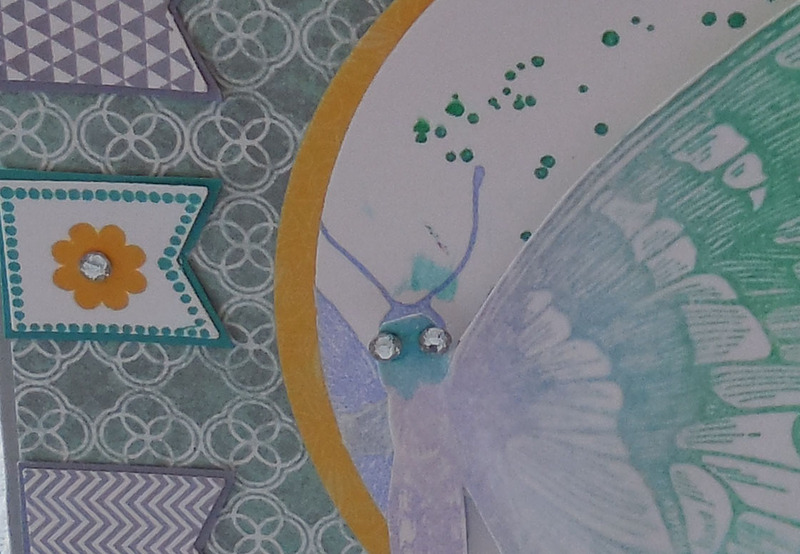 The butterfly is stamped twice and layered with dimensionals for a 3D effect. The banners along the side are stamped using Island Indigo, Wisteria Wonder and Crushed Curry ink. The banners are punched out using the Banner punch from the Sale-a-bration flyer. So don’t forgot to check out these items. You can see my online store here to place an order. Click on the SHOP in the upper right corner! Also – check out my Stamper’s Club! Like my cards and ideas? For $35 a month you can join my Stamper’s Club and receive exclusive projects and ideas each month. You can check out more information on my Stamper’s Club here. Happy Stamping! handmade card, handmade cards. Bookmark. Last day of Sale-a-bration – Last chance to….